A New Investigative Industry Trend! The Complete Field Manual And Bible! By Robert E. Spiel, Jr.
An often overlooked private investigative specialization that is vastly on the increase these days is art theft investigation and forgery. In the art world, even an inexpensive work is over $10,000 and there is a new generation of collectors that's on the rise! These collectors are easy to tap into and often need theft and forgery type investigations that's becoming a mainstay in the investigative industry! Art theft and forgery investigation has quickly developed into a 1.3 billion dollar problem worldwide and investigators who know how to conduct these types of investigations are in high demand! This comprehensive training manual gives you a heads-up grounding in the techniques used to conduct art theft and forgery investigation that will make you an investigative expert on the subject in this major new trend! This section gives you a basic overview of the art world as it relates to conducting investigations for experienced investigators and advanced students. Seven separate sections define how to conduct the interview of art theft and forgery. This section reveals how art thieves steal and gives you methods used by forgers. 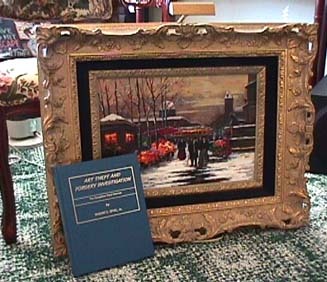 You will also find highly detailed sections on methods of selling as well as art forgery distributors. This section starts out with expert checklists and investigative priorities. You are then overviewed of basic legal weapons you can utilize in your overall investigation. The last section deals with art insurance and rewards. This section starts out with terminology and then goes into to specific details for your investigation. It contains sub-sections in the use of experts, contact groups, classifications, and other investigative techniques and technology to make your investigation a success. This valuable section gives you hands-on field training on exactly how to deal with suspects to bring your investigation to a successful conclusion. This section starts out with a very useful sub-section on the secrets of developing art crime informants. It then goes into specific investigative techniques as it relates to art theft and art forgery undercover operations. This sub-section starts out with investigative techniques and legal information you'll need that relates to recovery and seizure. You are then treated to a special expert section on unidentified victims. The final section deals with legal and investigative aspects of post recovery and evidence.